How amusing that Royal Mail is to issue a first class P&G stamp depicting a snail. Now we can all have a genuine example of snail mail in our collection. Received Royal mail notification of Wednesday 9th Januarys Revised colours Definitives last week, Having made a trip into Hereford, was told at the General post office in St Peters Square. Only to find that they did not have them. Talked to manager, who showed a distinct attitude of well i dont really care alot, we have to get the old stock down, because they ( Royal Mail ) will only send us the new stamps which were due today, when they think we need more definitives. So called nearly every post office in Hereford, and guess what not 1 had the new set of 9 stamps, If this is the typical attitude of the Royal mail post offices and their staff, the sooner they close the non efficent post offices down the better. This is a slightly obscure argument because of course if the stamps are no longer available on the day of issue, they cannot be bought then. For definitive FDCs RM recognise that their main sales channels are their own standing orders and trade (ie dealers). This suggests that the number of collectors now making their own FDCs of definitives is very low. Given that you would have been unlikely to have found the new red coil stamp in any post office, you could not have been able to prepare a complete FDC with 8 new red stamps at all. I appreciate that. Good site for we collectors. 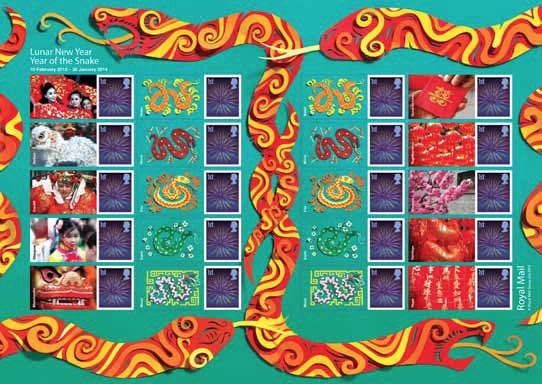 Could anyone tell me where I can buy the year of snake 2013 stamps in UK, please? Could we buy in any post office around the UK? You can't buy the Snake at every PO in the UK, in fact very few will carry it. If you are in London it will be at Trafalgar Square. Let me know by email [ian @ norphil.co.uk] where you live or work and I'll try to be more specific.